1　Lit. eight bridges. 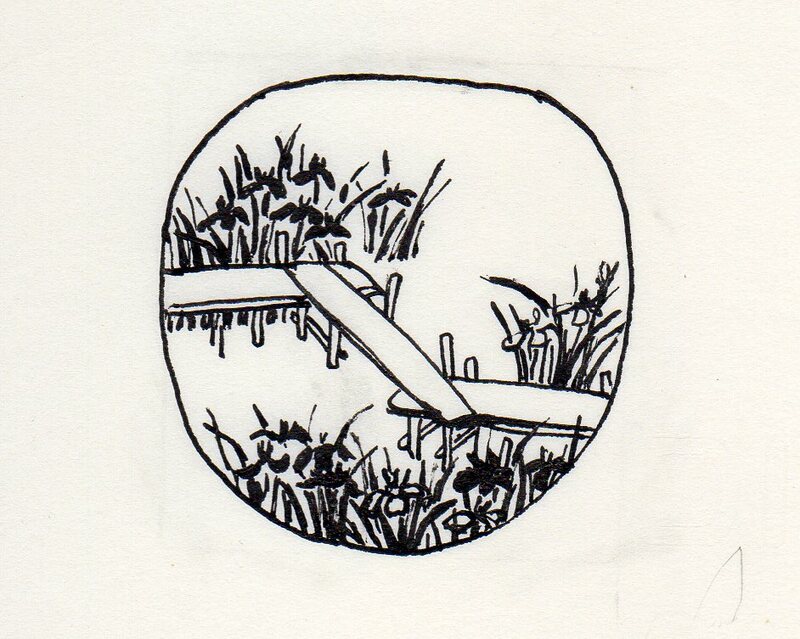 A type of low bridge built over a shallow pond or marsh using wooden planks without rails laid in a zig-zag pattern. 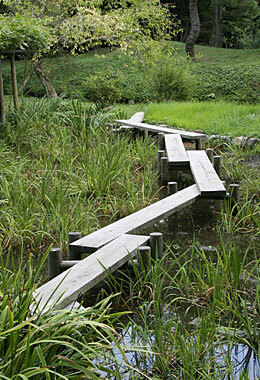 Although the name yatsuhashi means a bridge of eight planks, the term is also used for bridges of greater or fewer planks. The name yatsuhashi comes from an incident in the 10c ISE MONOGATARI 伊勢物語 (The Tales of Ise) in which the story's protagonist and his companions stop to rest at a famous iris marsh traversed by an eight-planked bridge. In Edo period gardens, especially those built by daimyou 大名 (see *daimyou teien 大名庭園), yatsuhashi were often built over iris marshes in an obvious reference to ISE MONOGATARI. A good example is found at Koishikawa Kourakuen 小石川後楽園, Tokyo. 2　Yatsuhashi. Originally located in Mikawa 三河 province (now Aichi prefecture) just off the Eastern Sea Road, Toukaidou 東海道, where the Azuma 逢妻 River (wife meeting river) branched into eight streams, each requiring a bridge. Mentioned in Episode 9 of ISE MONOGATARI 伊勢物語 (The Tales of Ise : see *ise monogatari-e 伊勢物語絵 and *Azumakudari 東下り) as a place famous for irises kakitsubata 燕子花. The protagonist, often identified as Ariwara no Narihira 在原業平 (825-80), composes the following acrostic on kakitsubata: かきつばた;Karagoromo /kitsutsu narenishi /tsuma shi areba /harubaru kinuru /tabi wo shi zo omou からごろも　きつつなれにし　つましあれば　はるばるきぬる　たびをしぞおもふ [I have a beloved wife /Familiar as the skirt /Of a well-worn robe /And so this distant journeying /Fills my heart with grief] (trans. McCullough). The theme sometimes rendered only as irises and a few (not eight) foot bridges without human figures is found in *Rinpa 琳派 paintings, lacquer ware decoration and in *ukiyo-e 浮世絵. The most famous example associated with this episode is a pair of folding screens of "The Irises" Kakitsubata-zu 燕子花図 by Ogata Kourin 尾形光琳 (1658-1716) in the Nezu 根津 Museum, Tokyo, where only patternized flowers are depicted without bridge or human figures.